How do I get a Celebrity Smile? Ever wonder how celebrities dazzle us with their perfect um well everything. Tooth be told, 47% of people notice smiles first above appearance, hair, eyes, smell, and clothes… That’s a lot of noticing! If you have ever thought of or wanted that Hollywood smile there are options to get exactly the smile you always dreamed of….sigh! First and foremost, it is extremely important to talk to your Dentist about your smile goals, and use lots of pictures to get the point across. You want to work with a Dentist that explains everything, and most of all listens to you. Make sure that your dental office takes lots of pictures. It is good to see progress, and have a base to refer back to. Find a Dentist who has your oral health in mind above all, realistically achievable goals, and will always makes sure you know all of your options. Whitening: Sometimes, this is all you need to brighten up your smile. Within 1 hour, you can have up to 8 shades whiter with Zoom and the combination of at home bleaching trays. However, if you have previous work done in the smile zone like veneers, crowns, or fillings this bleaching method will not lighten anything un-natural unfortunately. It is always a good idea to whiten your teeth first before having any other dental work like fillings, crowns, veneers so they can be matched after to you whiter tooth structure. Invisalign: One of the best kept secrets of Hollywood for straightening teeth. Within 6 months you could have your celebrity smile, without brackets. Some prefer the wire and bracket method primarily because you have to wear your clear (invisible) retainers for 22 hours of the day, remove while eating, and diligence with wearing the trays for 22 hours a day, oral hygiene, and flossing are imperative. Conventional Braces: Let`s call it the wire and bracket method. For people who have some serious crowding, or rotated teeth this could be your only option. For elder patients sometimes the conventional method, embarrassment or inconvenience of having wire and bracket braces is too much. But there are always more options. Veneers: An alternate option to an orthodontic approach. Think of a Veneer as a thin, protective cov ering for your tooth. A veneer is a type of cap or partial crown that only is attached to the front surface of the tooth. Veneers are truly the Hollywood approach to a celebrity smile. Although effective and instant, some natural tooth structure will be removed, and excellent oral hygiene is a must. 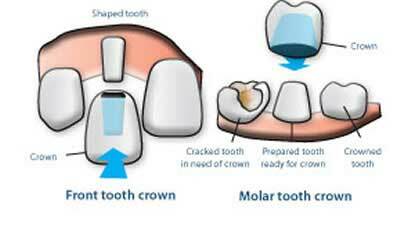 Crowns: Sometime Veneers w on’t cut it. Crowns are made for teeth that have gaps between them, are rotated, or need a different shape to complete the cosmetic look. The only problem with this method is that a lot of natural tooth structure is taken away to make the preparation for the cap. Ideally veneers are a better option than crowns, but not all teeth are able to take veneers. Bonding: Bonding is a great option for those on a budget. Essentially, filling material is added to your teeth and reshaped. The only issue with this method is eventually this filling material will need to be replaced, as filling material tends to absorb stain but not lift after 5-10 years. However, this procedure can be done in-office within 1 appointment. Consult with your Dentist for further information to see if any of these options are good for you. Please feel free to contact Westview Clinic for any of your inquiries, or more information on a Hollywood Smile. Previous Post:What is Sleep Dentistry? 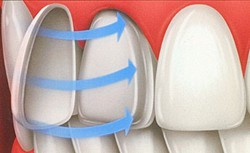 Next Post:How Cavities form – and how to stop them!